A detective discovers she's able to communicate via a ham radio with her estranged father who died decades earlier. She warns him of his untimely death, leading him to survive, but also dramatically changing the present. 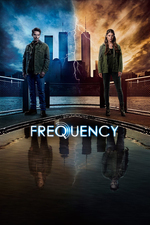 Frequency is one of those movies that I get sucked into re-watching whenever it pops up on cable, despite owning the dvd. It doesn't really obey its own rules of time-travel logic, but it had some beautiful filming & scoring (the whole Buxton fire sequence especially), and great chemistry in the cast. So, I had to check this pilot out. Not bad? I think it's going to have the same problems with maintaining long-term continuity, especially if it lasts more than a season, but the casting seems good. Curious to see how it plays to people who haven't seen the movie, for me it was a little jarring when the tv characters' lines got too verbatim to the movie dialogue, but I think it also put me more onboard for the show than if I was watching it blind. It was a whole lot better than I expected. Enjoyed the movie when it came out, but I have not seen it since and don't remember a lot of the details. I wasn't sure what to expect here, and questioned how they would turn it into a series. I like what I've seen so far. Over the first season it seems she will be investigating her mother's murder with the help of her father, both cops, 20 years apart. Will she tell her dad about his death? Will she tell him about her mother's disappearance? Will she run into problems if she keeps changing the timeline and absorbing the memory of new timelines? I really liked the movie and this is a pretty good do-over of it, except changing the time, the gender of the child, and the "dirty cop" thing. It hit the same notes I liked in the movie. I don't know how well this is gonna go for an entire season, mind you, but it wasn't bad. Better than I expected. Makes me feel old when I realize the "old" timeline is post-Nirvana. I have never seen the movie but this episode felt like it could have been a stand-alone movie without the next-episode twist at the ending. I enjoyed it, I liked the lead actress in Mad Men so it's great to see her doing something so different. I can also see how they could make this a season with multiple altered-timeline episodic stories, but not sure whether there's a story arc here. I imagine Mekhi Pfeiffer's character could somehow kick off an arc, but not sure how. I imagine Mekhi Pfeiffer's character could somehow kick off an arc, but not sure how. Seems like his primary function will be as designated-exposition-giver. In the movie, Frank was a firefighter, so Satch (Andre Braugher) was his friend & neighbor rather than them having been on the job together, but close enough friends that Satch clearly acted as a kind of surrogate father to Frank's orphaned son in the original timeline. Now that Frank's early death has been erased, I think Satch is mostly going to be doing a lot of "what are you talking about, Raimy, don't you remember [new timeline event]? ", but maybe if they continue to poke around at the circumstances of Frank's near-murder along with trying to stop the Nightingale murderer before he gets to Julie, they could have some 1996-Satch-in-jeopardy scenes too. One of my favorite movies, so I was wary, but I like this so far. The weirdest thing is the 1960 ham radio, though. I thought for sure her father would have an early cellular phone in 1996, and she'd find his old brick phone in the garage and talk into it. I was annoyed by Raimi's boyfriend, but I loved the twist that he didn't know her after the past was changed.